Note: Today’s post is based on my 2017 Christmas letter. So if you’re on my card list, you’ll be reading something that feels familiar! Author and speaker Michael Hyatt is adamant in his advice to exceed client/customer expectations. We must do whatever it takes to produce a WOW! response when clients/customers use our products or services. An unworldly young girl receives the angel Gabriel’s announcement that the Holy Spirit will come upon her to impregnate her and, oh yes, did I happen to mention your baby will be the son of God? Joseph himself received a WOW! dream notice from an angel regarding the situation so that he understood. There must have been some really amazing faith between Mary and Joseph for them to accept, believe, and act upon these angelic tidings. Then the two of them receive the WOW! legal notice: Leave Nazareth and travel about a hundred miles (eight to ten days of walking) to Bethlehem where Joseph’s ancestral records are kept so that your family can be included in the census of the Roman empire. But there is not a word in scripture about Mary complaining about traveling on foot or perhaps riding on a donkey for over a week while heavy with child. And no matter what concert you last attended, I’m sure the sound and lights can’t compete with the multitude of angels…the great company of the heavenly host who appeared to the ordinary people, the lowly shepherds…the first people to hear the news. The one you have been waiting for is here. The Messiah has been born in Bethlehem. Can’t you just picture those shepherds looking up into the night sky and uttering a collective job-dropping WOW? And after finding the child, they went around and did what they were supposed to do—spread the good news and, I’m sure, received many WOWs in the process. 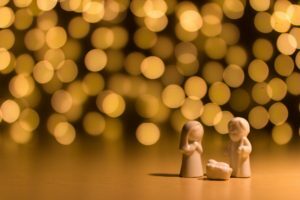 It’s easy to understand why the story surrounding the Messiah’s birth is the first chapter of what’s referred to as The Greatest Story Ever Told. And what would a great story be without a gift for its readers and listeners? The WOW! message for each of us is the most well-known, most widely recognized verse of the Bible: the third chapter of John, verse 16. For God so loved you.